Construction workers and Evanston officers have blocked off the intersection of Sheridan Road and Chicago Avenue due to a gas main breach. No one has been injured. 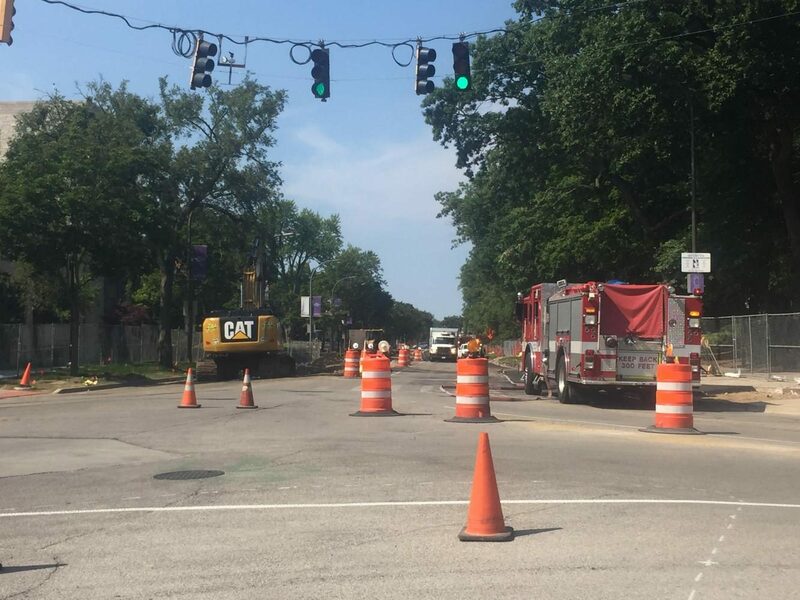 Construction workers on Sheridan Road breached a natural gas main Monday afternoon, temporarily closing the road and leading to the evacuation of Scott Hall. The breach occurred just north of intersection of Sheridan and Chicago Avenue, said Gloria Graham, University Police deputy chief. As a result, Sheridan was closed to traffic between Hinman Avenue and Foster Street, and Chicago was closed between that Sheridan and Clark Street. The Scott Hall evacuation was precautionary, Graham said, and mainly Northwestern faculty and staff were inside. No one was injured and no one in surrounding buildings was deemed to be in danger, as the leak was considered small, Graham said. “It’s what they consider to a be a localized leak, which from their determination is not as severe as a true break in the line, so the only place affected Scott Hall,” she said. Nicor Gas arrived on site as of 4 p.m., construction workers said, who added that they would be able to cap the leak and reopen the road within about two hours of arrival. Workers said that there would be no gas service interruption to any buildings. This story was updated Tuesday morning to reflect that the road closure has ended.